The Strategic Quality Manager: creating an effective quality management system in healthcare. As the pressure on our health and aged care services grows, so do the demands on the quality professional and continuing to increase the quality and transparency of healthcare will require new and savvier ways of working. 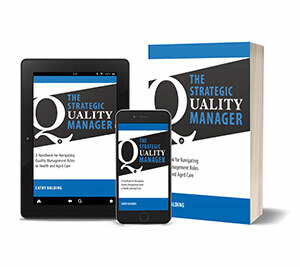 If you have looked for assistance within this challenging environment, you’ll know that there is no shortage of material on quality management, but very little on being a quality manager. The Strategic Manager contains theory, tips, step by step models and practical examples to assist every quality professional to more easily and proactively navigate the many of challenges of their roles – and to enjoy the journey! ‘This book is a valuable resource for anyone working in the quality ﬁeld, regardless of their position title. Each chapter looks at a particular component of quality improvement, including effecting change, quality leadership and strategic quality planning…there is a strong focus throughout the book on practical strategies for working within an ever more elaborate health system. The ﬁnal chapter focuses on building the brand of a quality manager …including some reﬂective questions for current managers. It is a must read for new quality managers or those feeling a little weary of the many challenges in this ﬁeld. Balding's extensive policy and practice knolwedge and experience in healthcare quality management authoritatively underpin this thoroughly researched guide. A/Professor Kerin Robinson, Australian Health Information Management Interchange, 2012. Perhaps it’s best to start with what ‘The Strategic Quality Manager’ is not. It is not an academic text on managing quality and clinical governance in healthcare – even though relevant research, tools and techniques are discussed. It’s not ‘the answer’ – unfortunately! – and it won’t magically turn your role into a dream career. It’s not about teaching experienced quality managers how to do their job and it’s not a comprehensive exploration of the ins and outs of quality and risk management. ‘So, what is it?’ you ask. Well, it is a book for people like you who: managers, directors, leaders and coordinators of quality, improvement, compliance, redesign, risk management and clinical governance – in acute, aged, primary and mental health settings ( you now understand why I’ve limited myself to the generic terms ‘healthcare quality manager’ and ‘quality professional’ throughout the book!) It is also designed for those who may be considering working in these areas, involved in quality as one aspect of a broader role, or who are managing or mentoring quality managers and would like to better understand and support their role. The content is based on the premise that, to be successful as a quality manager, you need to be clear about your purpose and strategic and proactive about achieving it. It’s about better understanding and navigating the amazingly complex healthcare environment to maximise your effectiveness. It offers information and tips for surviving and thriving as a quality professional, a title and role that often come with big responsibilities but little formal power, expected to juggle numerous hats and achieve improvement every day. But mostly it’s about developing and supporting quality managers who want to build on their operational demands to be proactive and strategic leaders in their organisations and in their field. The ideas for the content are also derived from the hundreds of quality managers I’ve worked with and met over my years as a quality manager and consultant. Many of these quality managers are asking the same questions: Why am I not enjoying my job more? Am I doing the right things? How can I get things done when I have no formal power? Why do my change efforts fail? How do I develop credibility? If you have looked for answers to these questions, you’ll know they can be hard to find. There is plenty of material available on quality management, but very little about being a quality manager. Some quality professionals are lucky – or proactive – enough to have access to mentors or a peer group that help smooth the way and can provide guidance. Some information is gleaned through courses, conferences and meetings. Most people, however, particularly those working in isolated areas and/or as a sole practitioner, tend to learn how to be a quality manager through trial and error. This can result in a reactive, task driven quality manager role because others in the organisation don’t understand what the job is really about – so it is treated as a ‘fix all’. So the content is written as a handbook for quality professionals and is a combination of relevant literature, research, my own experience in quality management roles and what I’ve learned working with quality managers over the past two decades. The principles are common to all healthcare sectors and can be equally well applied across acute, community, aged and mental health services. A range of knowledge, theory and strategies are drawn on, including those you may not find in generic quality management resources, and synthesised and interpreted for application by those in quality management roles. The book is based on the premise that the quality professional does not exist in a vacuum, but functions in an incredibly complex and challenging environment. Understanding this environment is the first step to operating effectively and proactively within it, and breaking out of a reactive, task driven quality role. With greater knowledge comes more options and greater flexibility and control in the way you navigate the harsh healthcare terrain to more effectively fulfil a healthcare quality manager role; a role that is evolving and changing before our very eyes as part of the broader evolution of health and aged care. Although the rewards can be great when you have a win, there are many treacherous traps and pitfalls for the quality manager in this complex environment, and this book endeavours to provide some inside information to help render the journey a little less hazardous and more enjoyable. The ‘quality professionals’ essentials’ kit. The result is really a conversation about being a quality manager; theory and practice, lessons learned, top tips and – possibly – more questions! Depending on where you are in your professional life cycle, it may help you take stock and design – or redesign – your role for greater organisational impact and job satisfaction. If you’re thinking about taking on a quality position or questioning your current quality role, the material in this book may assist you to decide if this is the job for you. If what you’ve read so far has you nodding, rather than nodding off, The Strategic Quality Manager is for you! Sign up for QualityNews to receive monthly information on a hot quality topic: click on the 'Free Quality Assessment Tool' button at the top or bottom of this page. You'll also receive - you guessed it - my free one-page quality system performance assessment tool. You and other quality leaders in your organisation or service can use it to take an honest look at what your quality system is achieving and to plan to get the results you want - and need. Break out of the compliance rut and get a better return on investment for all that hard work at point of care - where it counts!